Two art fair affairs were set today. 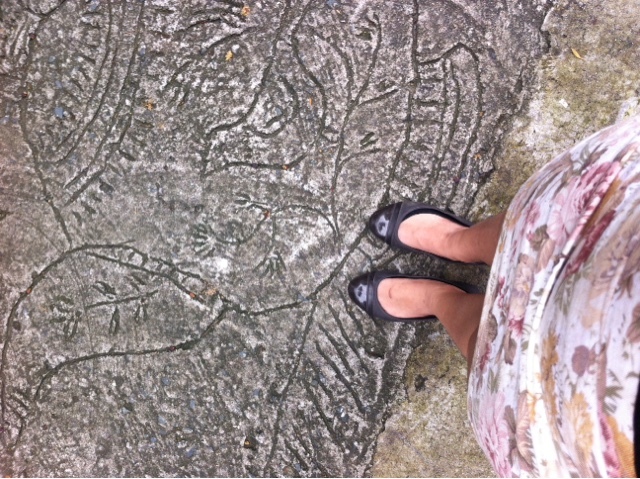 But the girl from the North decided to take on an easier commute and found herself trudging on etched concrete, its lines complementing the image glazed in navy on the white gate as she entered 10a Alabama. 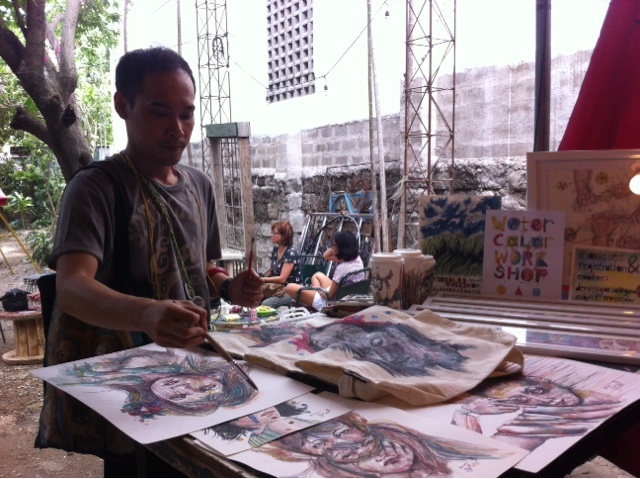 Since the place is part of a residential area, it's not that surprising that you'll be seeing a home (which is also a furniture house) that was transformed into a gathering of artists who are eager to showcase and sell their creations during the weekend. 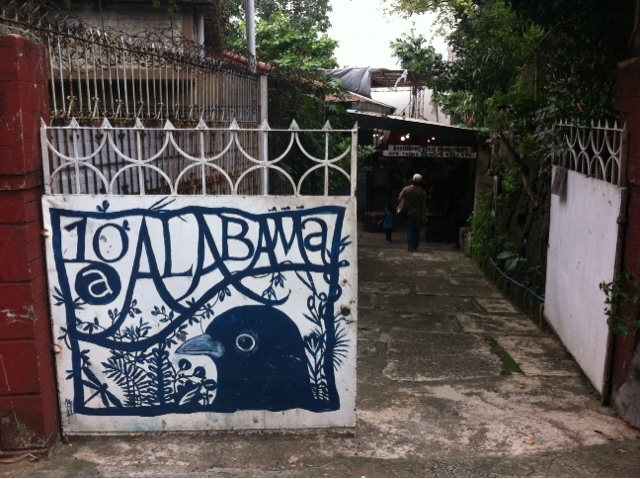 The 10a Alabama Handmade Arts and Crafts Fair happens quarterly on the narrow street that is cornered by E. Rodriguez Avenue and Tomas Morato Avenue. It lasts only for the weekend and it's possible that you'll be seeing different sellers (who of course packed different art mediums and novelty items with them) on each day. If you're anticipating the art fair just so you could purchase from your favorite Instagram shop and perhaps meet the people behind all the amazing works, you better make sure you know which specific day they'll be joining so you won't miss them! The bungalow, with all its segments crowded with tables, trinkets, and people, seemingly creates a small maze with eye catching finds placed on each corner and each wall. 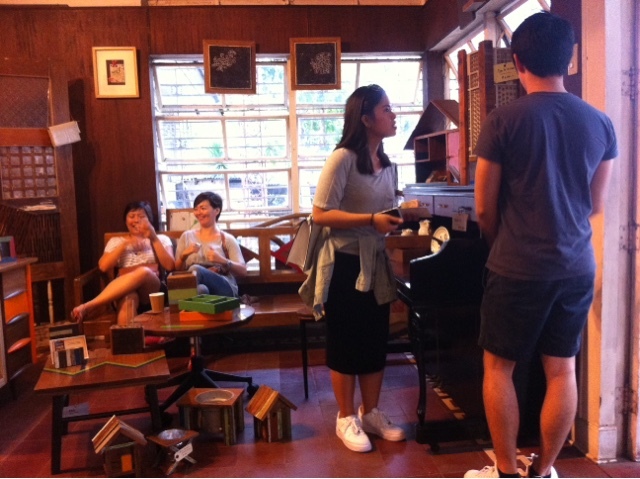 It's actually like visiting a disorganized, interactive museum as some works are really displayed on the wooden walls. They have various products available in the fair but the ones that interested me the most were the art deco pieces. 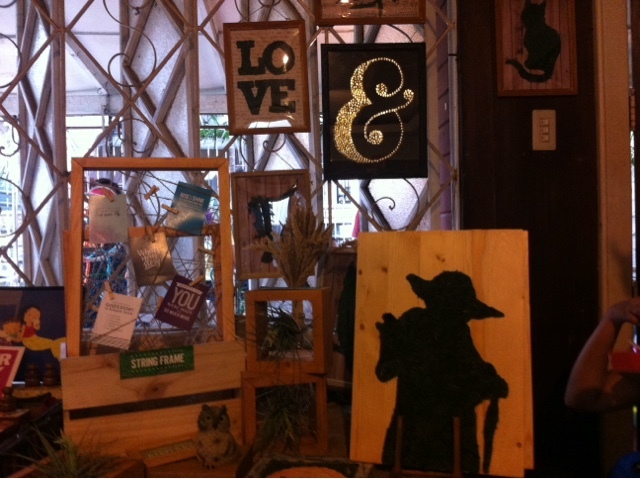 Aside from the usual original prints that you could frame and hang on your wall, I saw innovative pieces like Artefact's lamp made out of wood and old desktop keyboards and collages assembled on canvass; Habil Craft's moss art featuring Yoda and string and wooden clip frame; and many magnetic and cork boards that will help you get organized and creative. It certainly would delight minimalists and geometric art fanatics who have bare walls to fill. They've also got an abundance of postcards, notebooks, and stickers (you know, these are probably the mainstays of art fairs), all showcasing a different style. Hey Kessy had watercolor Star Wars themed postcards (I ended up buying three); Coffee Monsters had characters that were either inspired or made from drip coffee; Artefact had original prints of retro themed collages turned into postcards. Black Thumb. They turned the Beatles' Sgt. 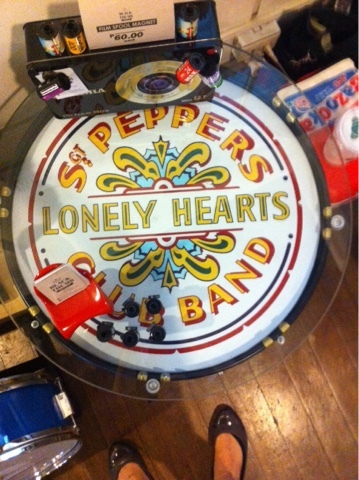 Pepper Hearts Club drum design into a table. Who wouldn't wan't that paired with yellow leather ottomans, right? With an odd and obvious fascination with drums, they also made clocks out of it. Fake Alchemy. Aside from jewelry made of quartz and lapiz lazulis, Fake Alchemy had geometric, three-dimesional designed containers made out of concrete for accessories and even small succulents. Jewelry by Dandy Ona. Simplicity surely exudes elegance with her silver, glass, and paper cut creations. The designs are are intricate and fluid, all with a feeling of delicate minimalism. bagsbyrubbertree. 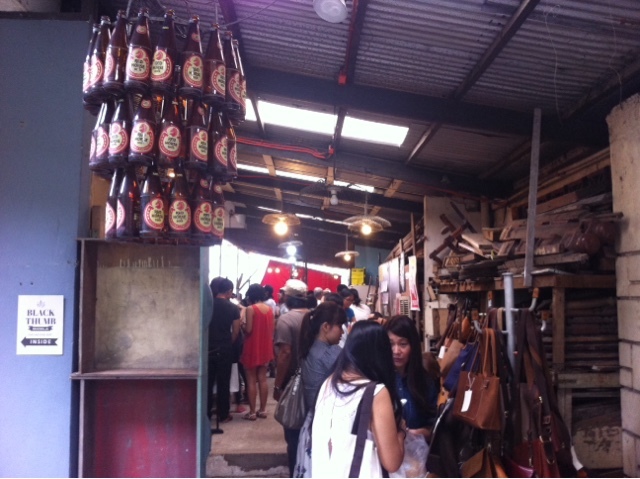 Their leather goods are all classic. 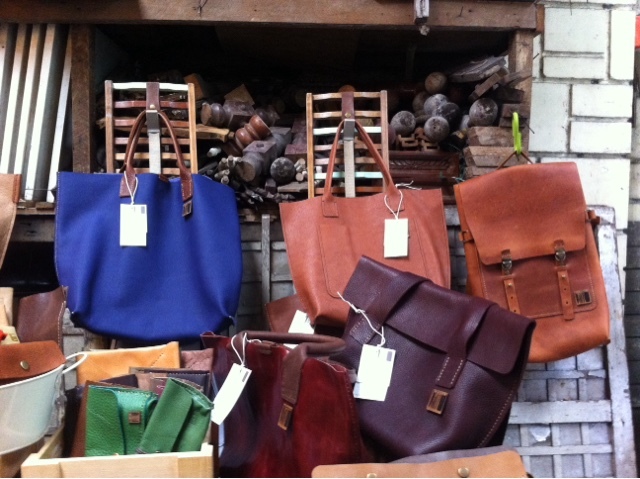 Simple, rustic, and versatile tote bags, body bags, and backpacks that would definitely go with any outfit. They also had leather pieces that were meant to organize the little things in your bags: wrap-around pen holders, wallets, and coin purses. Watercolor works by Denver Garza. He's actually facilitating 10a Alabama's Watercolor workshop next week, July 26. He told me he first started painting with Acrylic and shifted to watercolor about four years ago. His works are mostly portraits and he shared that he finds his muses on old photographs. "I don't even know who they are or if they're still alive," he laughed as he showed me sepia colored pictures with tattering borders, which he randomly bought in malls. 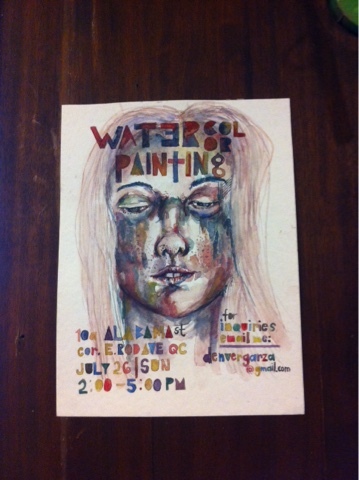 He also told me that he would be having a watercolor workshop for beginners this coming August. Denver said he'd start with the most basic things from square one, like blending colors and even the correct ways of holding the brush. People with zero knowledge on painting like myself should be thrilled. Sweet Leaf. Four words: White Chocolate Matcha Cookies. You can thank me later. The Craft Central.I've been wanting to start a hobby with their Calligraphy and Scribble sets since the workbooks are done by two of my favorite modern freehand letterers, Alexis Ventura and Abbey Sy. Hopefully they've got the art materials you need! Katrina Ysobel's burnt lettering on cork. Most of the calligraphy you see nowadays are made with watercolor and ink on paper. While I was browsing the #10aAlabama on Instagram, I saw some of her work. They're usually motivational quotes on cork board pieces that are the size of coasters. Aside from the familiar and conventional art media that we know, it was also a good concept to include novelty and artisan bites in the fair. There is art in making food after all. The moment we entered the place, we could smell savory spices, and the fact that there are spaces to eat and just hang out with your friends just ties the homey concept altogether. We got to snack on fascinating flavors of ice cream by Buccino's Ice Cream Experiments (BICE), which can compete with the imaginative and innovative creations of Sebastian's Ice Cream. Buccino drizzled the usual Dark Chocolate ice cream with olive oil, giving it a smoother texture and fruity taste. He also added olive oil with rose water, a blend that has a subtle tequila rose taste without that much cream liqueur texture. I got the Muscovado and Bacon ice cream which tasted like salted caramel with generous amounts of bacon bits with a powerful smoky flavor. Cordillera Coffee had cute designs on their paper cups and I just couldn't say no to it. I haven't had coffee in a long time since I think I've had too much during my senior year in college. I was having second thoughts on having a cup but they told me their beans are bought directly from farmers at fair trade price and that just sold it. The joe was a bit too acidic for me, but i could tell it was a medium roast since it didn't have that much earthy flavors nor was it too bitter. 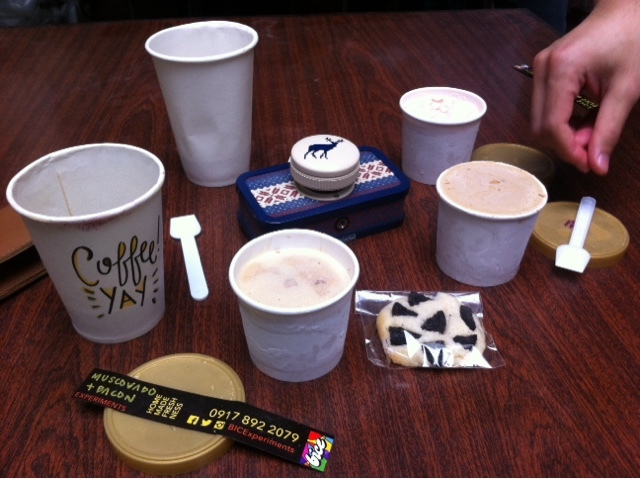 It was just right, a blend in between the strength of Arabica and Barako. I finished it off with an Oreo Cheesecake Cookie from EenieMeenie and it was so much better than Figaro's version. Overall, the art fair at 10a Alabama street offers more than the usual utility art that are commonly available nowadays. Although they also use the same popular techniques and styles that we see on the internet everyday, the artists here are more open and confident in explaining what the process and what their works are about. Personally I think there was no particular art booth that offered something new and distinct in terms of appearance and medium. But with the creativity I saw in the convergence of art and functionality, there is enough room for originality and innovation. See you in the next art fair!